Last week, I was talking to a children’s group at church about how we can show our thankfulness to God and others. It’s often simple, and doesn’t take much time. Yet cultivating a grateful heart increases our joy and can also be an encouragement to those around us. 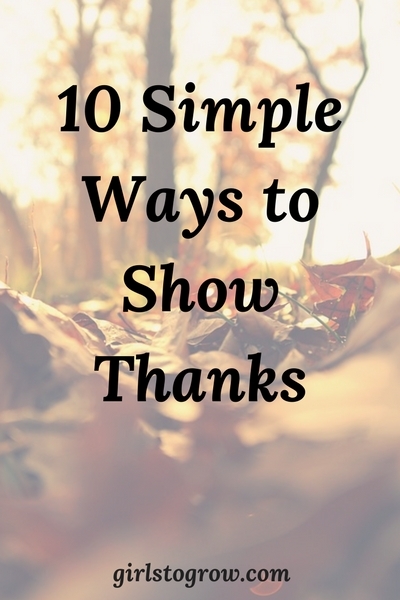 A couple of years ago, I shared ten simple ways to show thanks. I thought it might be helpful to revisit that list this November. If you did one of these each day, starting today, you’d finish up the list on Thanksgiving day! 1. Write a thank you note. After you write a thank you note, you may want to have your child(ren) write one as well. They could thank a teacher, coach, grandparent, or other relative. Younger children who can’t write could draw a picture and have you write down what they want to say. Then mail the card or hand deliver it. Sometimes it’s easier to write a thank-you note than to actually say the words out loud! Here are some suggestions to get us thinking. ~When you pick your child up from school, thank the teacher for his/her work in the classroom. ~Thank the cashier at the grocery store or the waitress at the restaurant for her service. ~Take time to thank your child for something they did – obeying quickly, having good manners, helping a sibling, etc. ~Thank your husband for the work he does to support your family. ~Let a co-worker know that you value how they do their job. You never know when your words could be just the encouragement someone needs. 3. Sing a song of Thanksgiving. Sing along with your favorite singing group, or just belt it out in your car when you’re alone. Here are a few hymn suggestions. Involve your kids, too, by listening to and singing children’s songs and choruses of praise. 4. Write a list of 10 things you can thank God for today. I try to write 3-5 things I’m thankful for in my gratitude journal each day. Here’s a sample. ~Words my husband said on Sunday: “God is always so much more faithful to us than we are to Him.” How thankful I am that His faithfulness doesn’t depend on mine! ~The group of K-5, 1st and 2nd grade students that I get to work with on Wednesday nights. ~Family and friends that I know pray for me. ~Apples that a sweet friend brought me from North Carolina. I love that this practice helps me notice the big and the small blessings I’m given. 5. Pray your list of thankfulness to God. Psalm 100:4 tells us to “Enter into his gates with thanksgiving, and into his courts with praise: be thankful unto him, and bless his name.” I like to think that each morning, as I begin my prayer time, I’m entering into His gates and coming into His courts, so I want to start that process with thanksgiving and praise. 6. Meditate on a Bible verse of praise and thanksgiving. Here’s a list of seven verses to get you started. Whatever verse you choose, make a concerted effort to think about it throughout the day. Write the verse out and post it where you’ll see it often, or lay your open Bible in a central spot and stop to read the verse every time you pass by. There are many ways to share what we have with others. ~Leave a larger-than-usual tip at the restaurant, pay for a stranger’s coffee, or set aside extra funds for a missionary family or a needy family in your church. ~Deliver baked goods to a neighbor, clothes in good condition to a shelter, or canned goods to a local food bank. Or, this time of year, you can pack shoe boxes for Operation Christmas Child. ~Give your time by letting someone who’s in a hurry go ahead of you in line, make a phone call to a person who could use encouragement, or sit still and really listen to your spouse and/or your children. Remember, giving helps cultivate a more Christ-like spirit in us. We know God is the ultimate giver, and we always want to look for ways to become more like Him. 8. Post a picture of something for which you’re thankful. This can be in a public forum or just in your home. If you’re on social media, post a picture there – or use a magnet to stick a photo on the front of your refrigerator! Every time you see it, take a minute to thank God specifically for what’s pictured. A fun craft project would be to make a collage with your kids. Cut pictures out of magazines or print out pictures from the computer of things they’re thankful for, then glue them on poster board or a large piece of construction paper. 9. Say a meaningful prayer before a meal. Many of us were taught as children to “say grace” before a meal. It’s a routine we often rush through – me included. But that brief moment before we eat each meal is a time that we can pause in our day to acknowledge the blessings of God. Let’s take time to really thank God for the food He’s provided. Rather than rote phrases, let’s use meaningful words, and praise our Father for meeting our every need. This is a habit our children can begin practicing at an early age. At that point, they usually enjoy the privilege of praying for the family. 10. Share with your family a time when you saw God’s blessing in your life. Maybe you felt God’s comfort through a trial, His protection through physical safety, a very specific answer to prayer, or His goodness manifested in a unique way. Whether it was recently or years ago, tell the narrative of how God blessed you. We are here on earth to glorify God Let’s do just that by telling others how He has worked in our lives. As the Thanksgiving holiday approaches, I hope we’ll all focus on God’s goodness and look for opportunities to show our gratitude to Him and to others. Let me know if you have other practical ways that we can show our thanks! Good thoughts. 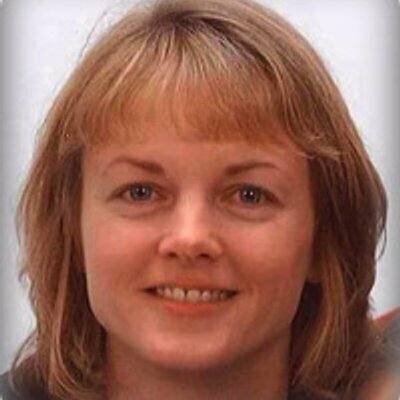 Thank you sharing, Tracey. Hope you have a blessed Thanksgiving and make wonderful memories. Thank you so much, Mrs. Chris!! Trust that you will have a good Thanksgiving as well, and that God will give you an extra dose of peace and comfort during this season. And by the way: I’m thankful for YOU. P.S. I know you’re not on Facebook (smart! don’t do it! ), so I wanted to let you know I just shared this on my blog FB page as part of my “12 Days of Thanksgiving” miniseries. Thank you so much for posting this! And I’m thankful for you!!! I haven’t gotten to that part of the Bible study yet, but now you’ve certainly piqued my interest! And because I know you can relate….just took our oldest daughter on her first college visit last week. Unreal!!! I’m like, “How did we get here?? ?” Anyway, the visit went well. She’s mainly considering two colleges, so the praying continues for all of us to have peace about the decision. This list is great! I do a few of these things but not often enough. Thanks for the reminder and encouragement! Thank you, Nikki! I’m thankful because you’re always an encouragement to me with you thoughtful comments. Hope you have a great week! !